The 2018 Cornerstone Student Awards Banquet was held on April 17th in the Burney Center at UNCW. 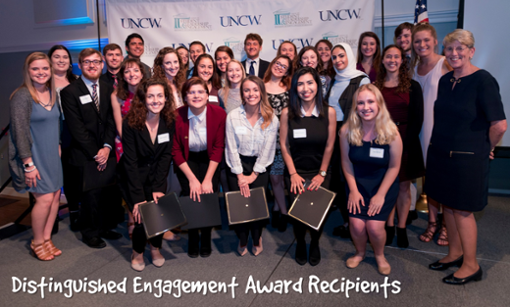 Each year, the presentation of the Cornerstone Student Awards recognizes the contributions of UNCW's outstanding student leaders. Congrats to this year's recipients! 2018 Margaret W. Lippitt Scholarship recipient! 2018 Martha M. Duncan Scholarship Award recipient! 2018 A. Farrell Teague Merit Scholarship for Rising Seniors recipient! 2018 Rachel Freeman Service Leadership Award recipient! 2018 William A. Bryan Senior Leader Award recipient! The 2018 Dub Awards event was held on April 5th in the Burney Center at UNCW. Each year, the presentation of the Dub Awards recognizes the contributions of UNCW's outstanding student organizations, fraternities and sororities, and individual student leaders within these organizations. Full a full list of the 2018 Dub Award winners, click here.